Red is tired of her dusty back yard and decides to plant a garden. She asks all of her neighbors to help pitch in. Rover the Dog, Patches the Cat, and even Doris the Duck. Will they help? 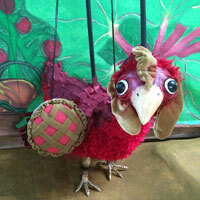 Join StoneLion Puppet Theatre in a new show based on the classic fairytale The Little Red Hen with a sustainable twist. Community involvement, water quality, and healthy lifestyles make the barnyard (and our planet) a better place. Musical puppet fun with a great message and even a working waterfall in the scenery! Fees: $589 single, $1178 double / Title 1 Schools may qualify for funding assistance. Requirements: Staging: 10' x 20' flat surface; Electrical: One 110 outlet. Teachers must be present at all times during performance.